Do you need more comfortable chairs for the office? Then it’s time to learn how to shop for ergonomic office chairs, high quality office chairs. Ergonomic chairs are office chairs designed to help workers maintain good posture and take off physical pressure from the body. If you have health problems, you can reap the benefits of sitting in ergonomic chairs because the chairs can help correct back and hip problems. Ergonomic chairs can offer this health improvement because the curve design of the chair provides excellent lumbar support to take pressure off the lower back. Our spines naturally curve and ergonomic chairs are designed to accommodate that natural curve to keep us from slouching. When shopping for ergonomic chairs, you should buy office chairs that accommodate your height and depth of your lumbar support needs. You can request special features for ergonomic chairs to reduce further strain from your body as well. When your body feels like stress, you’ll have the opportunity to prove your work productivity. 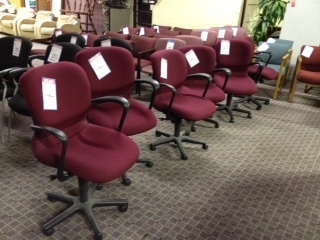 You can find the best ergonomic chairs available at a furniture store that offers both new and used ergonomic furniture. You can find the ideal ergonomic chairs for your office environment right here at Mark Downs Office Furniture. It’s up to you to see what we offer and identify how you will use our available furniture to create your dream office environment. What are you waiting for? Get started today with us. We are ready. This entry was posted on Friday, May 2nd, 2014 at 2:26 am. Both comments and pings are currently closed.